Create apps for smart TVs, Android, iOS, and the web to give your customers premium OTT experience. Vplayed’s fast playback formula supported by intelligent data rights management and profound marketing techniques aids marathon streaming with suggesting algorithms, watch history, and favorites on any platform. From uploading to monetizing, decide what goes into your platform in every process. Vplayed provides 100% customization on all fronts. Vplayed’s authentic HLS video player designed from scratch to engine distinctive operations is inbuilt into the OTT solution. Upload, manage and streamline unlimited video content embedded with flexible features. Powerful drag-and-drop publisher, unlimited cloud scalability & robust analytics lets you set foot on a tranquil streaming journey. Upload and manage your video assets from anywhere, anytime and on any device. 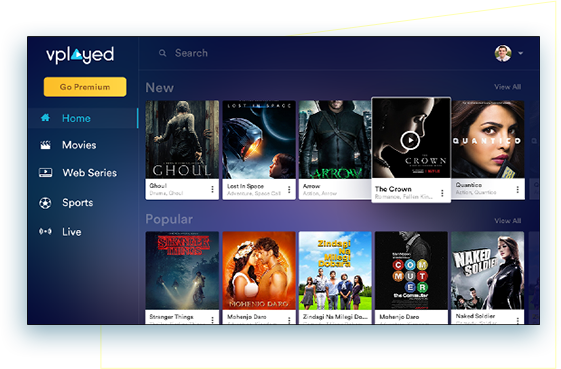 A wholly interactive and responsive multi-streamable OTT solution, facilitated with cloud accessing to streamline content consistently. Whatever the bandwidth, speed, and device; Vplayed’s adaptive bitrate streaming ensure to deliver an impeccable streaming experience enabled with RTMP streaming. A secured paywall integration assists you in transacting money in comfort. Both third-party integrations and customized built-in paywalls are done at Vplayed. Discover how every individual video content of yours are performing, and make real-time decisions. Capitalize every opportunity and benefit through Vplayed’s instant and real-time video analytics. Data right Management ensures your content is safe from cyber-infringements and stays on par with the digital right policies. IP restriction, Single-sign-ons, and options to hold accounts in individual or family sharing basis make Vplayed’s access solutions highly effective. Vplayed encodes sensitive data and files on the cloud through transcoding technology to safeguard your content from unauthorized interference. Seize large-scale audience by integrating flexible subscription models. Vplayed’s monetization system is framed to yield maximum revenue. Mushroom your ad revenue persistently by integrating with the leading ad partners and manage in-house ads efficiently. This internet TV feature lets viewers download and watch their favorite shows to a limited period of time at bargain rates. Vplayed’s Push VOD feature adds your best performing content to viewers’ personal video recorder (PVR) in prior and notifies them with the corresponding suggests. Peeling the Tech Geeks and Insights Happening Behind Spots of Vplayed. Vplayed is a media streaming solution that helps content owners, publishers and enterprises to build their own video & audio streaming platforms, powered with extensive features to support a wide variety of use cases.